This article deals with trade goods and their production and value before they enter the trade network or produce production income. For information about the trade network and income, see trade. Each province produces trade goods; the goods produced is the largest determinant of the province's trade value. In turn, trade value determines the province's production income and flows into the trade network. The base goods produced amount depends on whether the province is a colony or not. A colony's base goods produced amount is +0.01 per 100 colonists. Non-colonies' base goods produced amount is +0.2 per production development level in the province. Trading by merchant republic or trade companies +0.5% for each percentage of trade power in the local trade node controlled by a merchant republic or trade company. As of 1.16 applies to any province owned by trade company or another nation. Various events and decisions also impact goods produced. Trade value then flows into the calculations for a province's production value (in ducats) and the overall trade value of a node. Note that all values listed in the province window for trade value are shown as yearly values. The production and tax value calculations in the upper part of the province screen (which determine the ducats each provinces contributes directly to the treasury) are shown as monthly values. Gold is treated as a special case and does not have any trade value (see full treatment below). However, it does contribute to a province's production value. The trade value produced in a province flows into the province's trade node. Eventually it will be collected and turned into trade income. Local trade value also produces production income for the owner of the province directly; this income is modified by production efficiency. Every province produces a single trade good. Each trade good has a universal base value (for 1 unit). This base price is subject to change through special price change events. While most of these events are not tied to a specific year, they tend to fire usually around the same timeframe in most of the campaigns. It is possible to view the price modifiers affecting a trade good by hovering over it. The base price and the different price modifiers are summarized in the table below. Trading in bonus - Controlling at least 20% of the global trade in a trade good will give the country a modifier "Trading in (trade good)", which gives a national bonus. (The bonus is conferred when market share reaches 20% but a country will not immediately lose the bonus when its market share drops below 20%. In the case where no other market leader is present, the country will retain the bonus as long as it maintains above 15% market share.) The market share can be found in the ledger. Control is computed using the trade power share in each node times the amount of the good produced locally in that node. Per-province bonus - A province-level bonus applied to the province based on the trade goods being produced there (requires Rights of Man). Various trade goods trigger certain events when the player country owns at least one province which produces this trade good. The years noted next to the price modifier events are there for convenience only (earliest possible approximations based on technology, institutions and ages). The events are more likely to appear at later dates during a normal playthrough. Since gold is handled differently from the other trade goods, it is explained in a dedicated section further below. Map of gold-producing provinces in 1444. Gold is a special "trade" good that has both advantages and disadvantages: it will give a boost to the economy but also increase inflation every month. If a nation owns many gold mines it is possible that the inflation incurred negates the increase in income received. Gold does not produce any trade value; it is instead converted directly into ducats at the rate of 40 per year per unit of goods produced (except for primitive nations, which convert gold to cash at only a 1:4 rate, 10 times less). Income from gold does not benefit from production efficiency, and there is no manufactory for gold. A country will suffer inflation per year equal to 0.5 times the proportion of income from gold. Practically speaking, each 5.33% share of income from gold will require 1 administrative power per year to cancel out inflation if it is not removed through other means. To cancel yearly inflation from gold provinces without spending administrative power to reduce inflation manually, a country needs to have yearly inflation reduction modifiers. The amount of yearly inflation reduction needed is shown in the table below. The right column shows what percentage of total income can come from gold without gaining inflation. Note that yearly inflation reduction at or below –0.40 is impossible as this level can only be achieved temporarily with various events, decisions, triggered modifiers, and mission rewards, plus a Master of Mint advisor; in practice, it would very unlikely to have enough income from gold for this to be a problem. Gold income is affected by local autonomy, with a percent of the total possible income gained equal to the local autonomy being deducted. Assigning a province to the Burghers (or any other estate) with The Cossacks will still leave gold income affected by the 25% minimum autonomy, so leaving gold-producing provinces unassigned is better for income. Gold-producing provinces with a production development of over 1 now have a yearly chance to become depleted (halving gold production). With a production development level of 2 the depletion chance is 0.01% yearly, with higher development levels having higher chances (level 3 has a 0.04% chance, level 4 has a 0.07% chance, level 5 has a 0.12% chance, etc…). Each depletion reduces the province's base production in half (rounding down), (effectively halving the produced, but reducing by more than four times the depletion chance). The player can see the current chance of depletion by hovering over the production development increase button on the province panel. Rounded down to be displayed in the tooltip. Given a gold-producing province with a production development , over time it will deplete at most (rounded down) times, because a level 1 mine never depletes. Treating a gold-mine as a discrete-time linear system it is possible to estimate the production over a given period of time. A gold-mine in a province with a production development , is equivalent to a (rounded down)-th order system. A colonial nation subject receives no income from gold and instead saves it up and sends periodic treasure fleets to their overlord, as long as their overlord's trade capital is located in a trade node downstream from the trade node the colonial nation's trade capital is located in. If this is not the case, the colonial nations simply collects the gold as normal and pays the normal amount in tariffs. Privateers may plunder treasure fleets. When a country passes the Abolish Slavery Act, all its provinces producing slaves are immediately set to produce “unknown”. This will also remove any Trade Stations in the province if present, as well as the province modifier “Slave Entrepot”. A new trade good will be randomly reassigned at the beginning of the next month based on the new weights for that province. 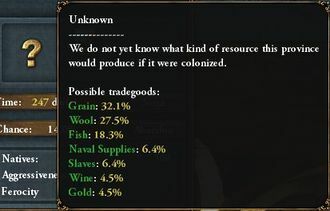 Colonies begin with “unknown” trade good and are randomly assigned a trade good after reaching a population of 400 colonists. The trade good is determined by a system of scripted weights. 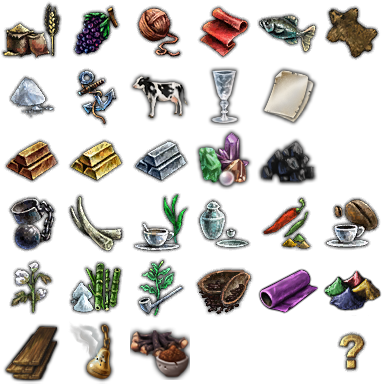 All possible trade goods are shown by hovering the “unknown” trade good icon of the province interface. Trade goods are weighted based on a variety of factors. The most common are geographic restrictions based on terrain, climate, and region, but some trade goods' probabilities are influenced by the culture and even religion (in the case of wine) of the colonizing nation. Silk will never be produced in a colony in a game with normal or historical nations, and cloth, while not directly excluded, is likewise precluded by its high development level requirement. where is the probability of a specific possible trade good, n is the number of possible trade goods in the province, and the sum in the denominator runs over all possible trade goods in the province. If a colony has started to produce a trade good due to growing over 400 settlers, and the colony is later destroyed before becoming a city, the trade good in the province will revert to “unknown.” Once a colony has reached 1,000 settlers and become a city, its trade good is fixed barring a few specific events (such as for slaves, see above). This table shows the base weights and various modifying probabilities for each trade good. Note that all provinces get a weighting, since custom setup can cause any province to be uncolonized. In the case of provinces that normally have slaves, the weights determine what it gets if the owner abolishes slavery. ↑ Trade goods base prices are listed in /Europa Universalis IV/common/prices/00_prices.txt. ↑ See in /Europa Universalis IV/common/static_modifiers/00_static_modifiers.txt (Static_modifiers#Production leader). ↑ See in /Europa Universalis IV/common/tradegoods/00_tradegoods.txt. This page was last edited on 31 January 2019, at 08:35.